Animal abuse cases are getting too rampant in Malaysia, with cruel, senseless abuses and killings of helpless animals by local councils and cold-blooded people. We must act NOW, and act FAST. Play a role in stopping animal abuse and cruelty! Sign the joint online petition by leading Malaysian animal welfare NGOs, and show how much you care about the animals. Together, we can make a difference. Please spread the word and tell your friends too. We need both local and international pressure to implement a drastic change on animal welfare laws and enforcement. Last edited by AndyKoh; 06-02-2011 at 01:52 AM. Last edited by bobcatJB; 05-29-2011 at 08:11 PM. Thanks for signing the petition and spreading the word! Actually there's already follow up action planned. This Sunday (Jun 5) there'll be a press conference during Mid Valley's Pet World Expo, attended by supporting NGOs and VIPs, together with a signing ceremony, and the first 10K signatures will be handed over to PM asap. This is Phase 1 of the plan, while petition will continue to get more signatures and follow up plans will be worked on. Please keep a lookout for the finalized details which will be broadcasted on PetFinder soon! Last edited by AndyKoh; 06-02-2011 at 11:09 AM. SPCA Selangor, June 2nd 2011 - The recent news reports on the cruel stray animal control methods employed by municipal councils indicate that despite public outrage and numerous pleas from NGOs for better stray animal management practices, legislators and elective representatives still lack the political will to consider alternative animal control methods, enforce animal protection laws or impose harsher punishment for cruelty to animals. Malaysia's inadequate laws, ineffective penalties and political apathy has come to the attention of the global community, and animal-lovers everywhere intend to lobby the Malaysian government into reviewing existing laws and practices. 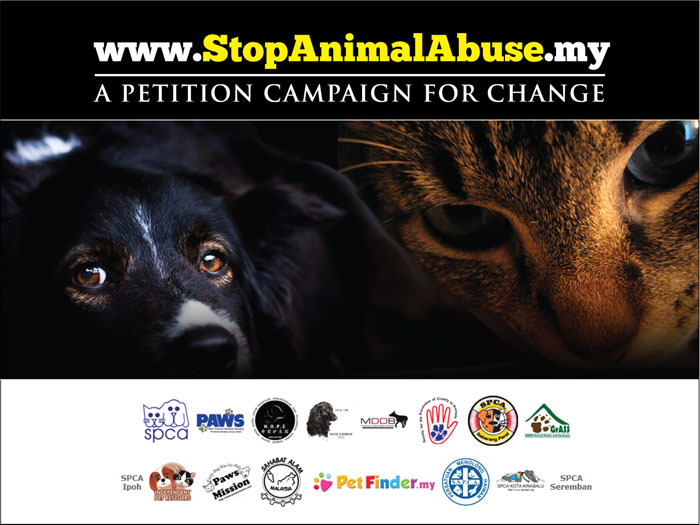 Since its launch on 18th May 2011, an online petition against animal abuse and cruelty in Malaysia (http://StopAnimalAbuse.my) supported by 16 local animal welfare organizations has garnered over 10,000 signatures. The NGOs hope to collect 50,000 signatures in the following months, and soon hand over the petition to the Prime Minister. Tan Sri Lee Lam Thye, a long-time animal-welfare activist will be attending the press conference and will lend his support by signing the petition. Other influential figures and celebrities are also expected to attend. Join us at the Pet World Expo event to show your support for the petition and animal welfare! Lots of lovely pets for adoption there too, as well as merchant booths and interesting programs. Last edited by AndyKoh; 06-02-2011 at 11:07 AM.